As cricket-loving kids, we all have them, that bigger, older guy who makes life fiendishly difficult. In Nathan Lyon's childhood, that guy was Dean Schofield, a left-arm quick. Among the clubs in competition for the title of best team in Young, a town in the south-west of New South Wales famed for its cherry crops, Schofield was the king of the Blues. Turning out in senior competition for the rival Young Hotel Dragons, a pre-teen Lyon had more than one sleepless night at the prospect of batting against Schofield. "He bowled left-arm quick and at that stage I thought he was the fastest bowler I'll ever face," Lyon tells the Cricket Monthly in Sydney ahead of the Ashes. "I think I was about 11 or 12 at the time. He was by far the best cricketer in town. He batted four and would open the bowling." "So I think I built my resilience and character from playing men at a young age, getting knocked down and getting hit and getting hurt, but being able to find a way to adapt and really push and compete against older guys. Looking now at my career, one thing I'm proud about is that resilience and being able to compete in different conditions against the best players in the world." That willingness to scrap took Lyon from Young to Canberra to Adelaide, and finally to Sydney, thrusting him into the Australian team after only four Shield games. The country upbringing helped him value character, loyalty and respect, and to develop the traits that saw him take over from Michael Hussey as leader of the team's victory song less than two years into his international career. It was only last summer that Lyon found himself in another scrap, this time for his very future as an Australian Test cricketer. Like Schofield, the doubts of many in Australian cricket seemed an insurmountable obstacle, and Lyon found himself questioning his own prospects of a long career. Rather than requiring physical courage, this was a test that needed Lyon to be mentally and technically nimble, aided by a pair of long-time confidants. What they put together lifted Lyon to a pair of wondrous Asian tours, and takes him into the Ashes as a standout example of rural resilience, spin bowling skill, and a level of adaptability not even he thought he had. A combination of brotherly one-upmanship and youth first pushed Lyon towards spin. Like most juniors he tried just about everything, from bowling seam-up to keeping wicket to batting. He was also a decent soccer player, known around Young for his dribbling skills left of midfield. But as much as the bigger ball had its charms, Lyon dreamed mostly of playing cricket for Australia, and competed most often against his brother Brendan. Backyard contests took place behind the family home, where a pronounced slope - steeper than Lord's at any rate - meant there was an advantage to be found in spinning it downwards. Given that Brendan had already chosen legbreaks in games where the brothers would bat and bowl from opposite ends, Lyon reasoned it was best to try spinning it the opposite way. "A fair amount of senior men were bowling mediums when I was growing up and there weren't many spinners," Lyon says. "There was only my brother, who I used to play with in the senior side. I always wanted to do something bigger and better than Brendan, which gave me confidence to bowl offspin. Luckily enough I ended up playing senior cricket as a guy who tried to bat a little bit but also bowled some offbreaks." Away from the backyard, on more level playing fields, it wasn't always possible to gain as much spin from fledgling fingers. In time, Lyon was learning that it was vital to beat batsmen in the air and, by extension, gain bounce, rather than relying on too much deviation from the pitch. "I was a pretty tiny fella growing up," he says. "I'm able to put more revs on it now, but I had to have the courage to flight the ball up as I wasn't going to necessarily spin the batsman out, so I had to try to do guys in the air." Guided in Young by his junior cricket coach, Dave Keenan, Lyon was soon contributing to club success and making representative sides. In one game they ventured to nearby Cowra with only nine men after a couple of late withdrawals, and came home victorious. By then a teenager, Lyon took three wickets while keeping the scoreboard tight. His talents seemed to be as much with bat as ball at that age. He can point to a couple of hundreds in junior competitions at the Bradman Oval in Bowral. "I used to rate myself as a top three or four batsman back in the day," he says, wistfully. "That just came down to facing my older brother in the nets and learning the game. But I think those days are well and truly gone!" If country competition had allowed Lyon to try all disciplines, the push to play more senior stuff brought focus. While a four-hour drive to Sydney seemed prohibitive, Brendan had moved to Canberra, and he encouraged Lyon to try out for the Australian Capital Territory (ACT) underage teams. "My parents and my grandmother all took turns in driving me over, 90 minutes both ways, for a Saturday or a Sunday game or even a training session midweek," Lyon says. "It was definitely cricket that drove me to Canberra, but then I was unemployed when I actually moved there, so that's where the green-keeping became a part of it. "When I moved, I started batting around six, seven or eight in grade cricket, and my bowling started to take more precedence. I realised I wasn't going to make it anywhere as a batsman. I really needed to nail down this offbreak bowling." Playing a role in that process was Mark Higgs, the former ACT and NSW left-arm spinner, who helped Lyon grow into the sort of spinner others began to notice. "He came in pretty raw but had natural loop with the ball, had good fingers, and was able to turn it. That was the thing that was really noticeable - he was able to turn the ball, and he was happy to bowl and ask plenty of questions," Higgs said in 2011, when Lyon first made it to the Australia side. Around this time Lyon also began to work with John Davison, who many will remember for his memorable World Cup hundred for Canada. Davison was also a fingerspinner of some skill, who had been used badly (by Victoria) and well (by South Australia) over nearly a decade. "I first saw him at Manuka nets," Davison says. "He wasn't overly impressive, he was very closed off, bowled around himself and undercut the ball a little bit, but always had a good attitude and was keen to learn. "Higgsy was of the same opinion, that he was bowling around himself. We spoke about straightening him up a little bit and he worked really hard at it. The next time I saw him he was much improved and had become a little bit more exciting. He just did the basics well, and I think that's held him in good stead throughout his career." By 2010, Lyon's growth was such that Higgs and others thought he was good enough to move to one of the states, and the former ACT coach Ashley Ross offered a pathway as a high-performance manager in South Australia. Though a formal contract wasn't on the table, Lyon ended up finding a job as a curator on the SACA ground staff, giving him proximity to a state side, if not yet a place in any squad. A picture of rural Australia off to the Big Smoke, he loaded up his ute and dropped in on his parents, then Keenan, before driving south-west. A tale told many times is how Lyon earned his spot in the state's T20 squad in 2010-11: by bowling beautifully for the ACT against the South Australia 2nd XI in the "Baby Bash" in Melbourne in front of Darren Berry, SA's T20 coach. Less known, though, is that Berry first saw Lyon rolling a pitch at Park 25, part of the rings of green parkland around the Adelaide central business district. Having already tried out unsuccessfully for SA, leaving him to juggle club games for Prospect and commutes to play for the ACT, Lyon took some convincing to have a bowl. "We were doing a centre-wicket practice session," Berry says. "Someone said, 'That bloke on the roller is a pretty good offspinner' and I said, 'Who is he?' and they said, 'Nathan Lyon, he's playing for Prospect and he's a groundsman'. "He was a very shy country kid, almost in awe of the state team. So I walked over to him and said, 'Mate, come and have a bowl' and he was all, 'Oh mate, gotta roll the wickets', but I insisted. He bowled three, maybe four balls, and I saw the ball come out of an offspinner's fingers with genuine fizz and drift and loop, and thought straightaway, 'This is special, this isn't just a flat offie'. 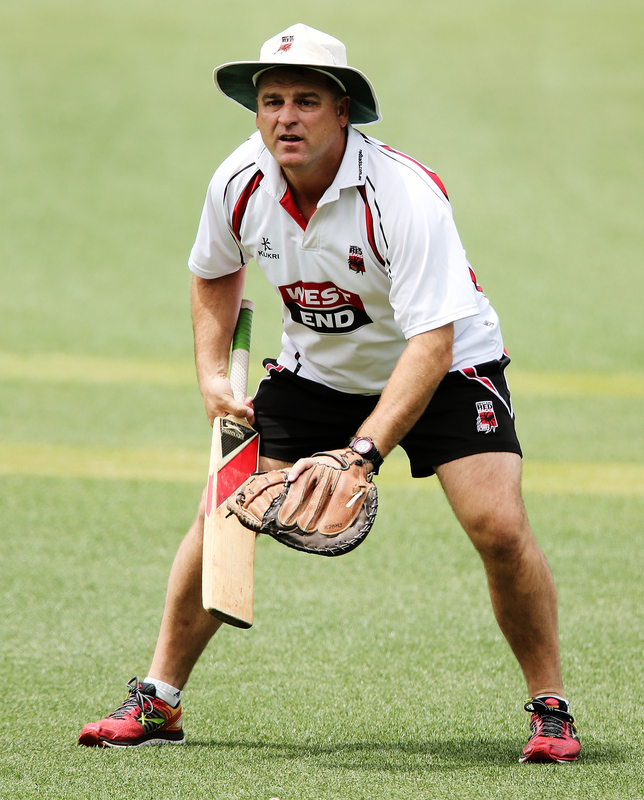 "At that stage I was just the coach of the Big Bash team. Coxy said, 'Well, he's not even in the state squad, he's just playing at Prospect.' I said, 'Get down here and have a look, I want to pick him.' Long story short, Coxy had a look and said, 'Yeah, looks pretty good, I'll back your judgement. [But] we're going to face a bit of criticism here for plucking someone from nowhere', but I saw enough in three or four balls to know this bloke is special." "I was pretty excited just to be getting a tracksuit, to be honest. I didn't really consider I'd be in the mix to play, but first training session Darren Berry sat me down and said, 'You're not in this squad to make up the numbers, you're in the squad to play. I'm all about spin bowling and attacking spin, so I want you to go out there and be brave and back your skill.' To this day, Darren sends me messages about the little things we spoke about, being brave and going out and bowling attacking lines." Redbacks won the Big Bash that season, betting big on Berry's "spin to win" philosophy. "That was where Nathan, basically, was found. I always say he was playing for Australia 18 months later, but it was less than 12 months from rolling the wicket at Adelaide Oval! It just shows that you don't have to go through the whole pathway to have skill to play." Lyon played the latter half of the Shield season for SA, and a final tick of approval to get him into the Australian team came from Greg Chappell, who was selector on duty for an Australia A tour of Zimbabwe in mid-year, and again for the Test series in Sri Lanka, where Lyon would debut, dismiss Kumar Sangakkara with his very first ball, and finish with 5 for 34 in his first innings. Chappell says the selectors realised the cycle of spinners tried since Shane Warne's 2007 retirement simply had to end. "A number of guys had been tried, and it's a bit hard because everyone wanted to judge any spinner on Warney. That made it hard for anyone following, but not even Warney dominated when he first came in. "Doubly [unfair] when it is a fingerspinner, if you consider that all fingerspinners, not just Australians, have come here and found it hard work. 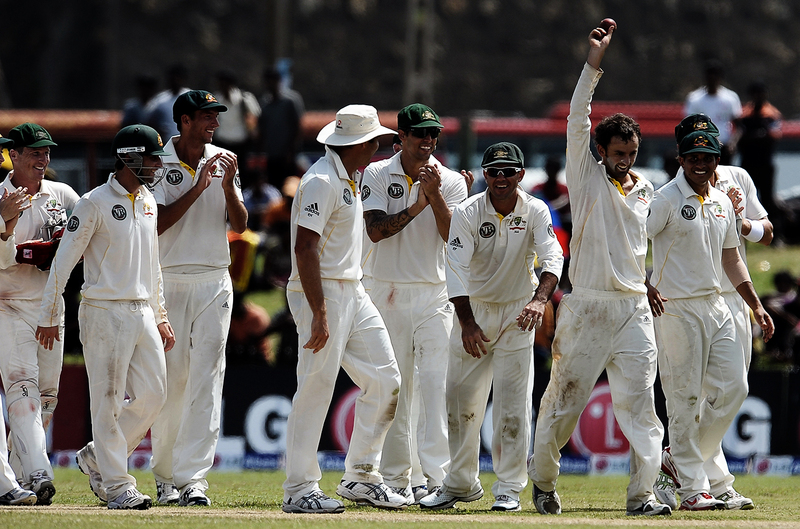 Nathan certainly struck us as someone who could be a wicket-taker." In Michael Clarke, Lyon found a captain who understood his art and showed a willingness to use him judiciously. Lyon also struck up a friendship with Hussey, who mentored him, gravitating naturally to the younger man's respectful persona, spiced with the occasional wisecrack and plenty of love for the dressing room. "Probably because he didn't have a great background of first-class cricket, Nathan was a little bit concerned as to whether he belonged in that environment," Chappell recalls. "But even while he was finding his feet, he bowled pretty well. "Michael was very good in the way he handled Nathan. He gave him plenty of opportunities to bowl. If he looked like he was in a bit of trouble, Michael would get him out of there, and then with a new batsman he'd get him back. He'd let him bowl against the tail and gave him chances to get wickets. That's what any spinner needs when they first come in at that level, because the margin for error is not that great." Given the speed of his initiation, what's most remarkable is how Lyon maintained a consistent place in Australian squads through the next five years, even though he was dropped from the Test team twice in early 2013. The second time, when Darren Lehmann had just arrived as coach in England, it was for the decidedly unformed talent of Ashton Agar, but even in that situation Lyon gained admirers for not sulking about the selectors' preference to gamble. "When you're on tour and you don't get the chance to play, you'd still rather be part of that squad than sitting at home or in the stands," Lyon says. "You can still make sure the guys who are playing have what they need to perform. I knew that my opportunity would come again and had to make sure I took it with both hands." From the moment he was recalled for the third Test of that Ashes series, at Old Trafford, until Australia rose to No. 1 in the ICC's rankings in February 2016, Lyon did just that. But things were about to unravel. 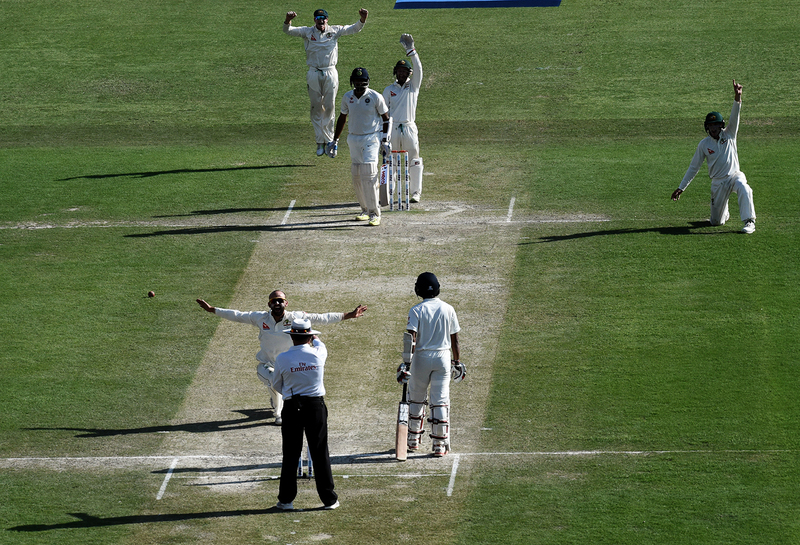 Of all Lyon's performances, none stick in the memory quite like the final session of the 2014 Adelaide Test against India. At tea on the final day, Virat Kohli and M Vijay were entrenched, eight wickets still in hand, and victory 159 runs away. Davison can remember sitting with Lyon during the interval as he coped with the pressure of being the man expected to conjure something from a wearing wicket. "There was a nice footmark that Ishant Sharma had created bowling around the wicket to Warner," Davison remembers, "and Nathan was creating a lot of chances. But Kohli and Vijay batted really well, put on a good partnership. I think Nathan had 1 for 90-odd at tea. We just spoke about how if we got one wicket it would be really hard for the new batters to start. I think that was a real coming of age for him. 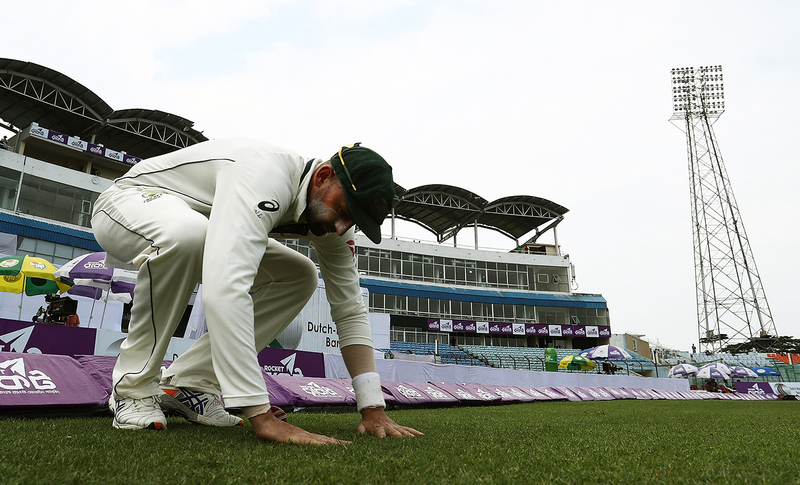 "It was such an emotional Test too, with the passing of Hughesy [Phillip Hughes]. I think he grew enormously after that innings in terms of his self-belief. He won the game against the best players of spin. Sharma did him a real favour creating that patch outside off stump, and he used it to full effect once he made that breakthrough." That afternoon ended whatever fourth-innings question marks existed about Lyon, but it still took place within the comfort zone of Australian climes - on an oval where he had once rolled the wicket, no less. In the UAE, a few weeks before Adelaide, he had been swept near enough out of his own sanity by Younis Khan, then swatted with impunity by Misbah-ul-Haq. In India in 2013 he had been dropped after MS Dhoni made mincemeat of his do-them-in-the-air offbreaks. Numerous Australian spinners can relate to that experience. Richie Richardson butchered Greg Matthews in Guyana in 1991. Nathan Hauritz had his Test career effectively ended by a disdainful Sachin Tendulkar in Bangalore in 2010. Jason Krejza's 12 wickets in Nagpur on debut in 2008 came at such a cost that he only earned himself one more Test match - in Perth of all places. And Warne, of course, was twice dismantled on India tours, in 1998 and 2001. Offspinner Gavin Robertson, who bowled at the other end to Warne on the first of those tours, has spoken about the discombobulation of trying to amend an Australian spinner's method in Asia. "You could almost have all those learnings on a whiteboard or some sort of document that relays 'This is the plan for this, we know what we've been up against before, knock it over,'" Robertson said in 2013. "We probably haven't learned from those past tours." Having been to India and the UAE previously, coming to Sri Lanka in 2016, Lyon had experience others had lacked. He was also facing a team of modest means, certainly nothing like the vaunted Indian top six, and few were counting on anything other than an Australia victory. Yet the series started to go awry from the moment Kusal Mendis decided he wasn't going to simply melt away in Sri Lanka's second innings in Pallekele, having watched how clueless Australia's batsmen had been against Rangana Herath. In a matter of hours, Lyon and the rest had fallen behind in the game. "Nathan's great faith in his stock ball is a positive, but it's also a little bit of a negative," says Davison. "Trying to bowl that perfect ball all the time, which batters tend to find some rhythm with in the subcontinent, that perfect ball in Australia isn't necessarily the most effective ball over there." Neither Steven Smith nor Lehmann has avoided public criticism of Lyon following defeats. After the Galle Test went even faster Sri Lanka's way than Pallekele, Lehmann let all and sundry know that Lyon was not doing the job. His "experience" had been very good over a period of time, but his record on the subcontinent needed to be better. "So he's got to improve," Lehmann said, "there's no doubt about that." Davison, watching at home after the touring party elected to use Muttiah Muralitharan and Sridharan Sriram as Asian spin consultants, reasoned that the adaptation required was going to take more time and work than was available in Sri Lanka. "But it's easier said than done. Someone like Jon Holland for his first Test [in Sri Lanka last year] - they want him to bowl differently to how he's bowled throughout his career. That's a big ask. In the spin weeks we do now, we practise in varying conditions. We've got to start that education of bowling in different conditions at a really young age." Following the losses in Sri Lanka, dealing with the pressure from coach and captain to "do what Herath does", and facing another home summer, Lyon was not in the best frame of mind. "One of the things you do find out when you're at the top of the game," he says, "is who your mates are when things are going well but also when things are not going so well." 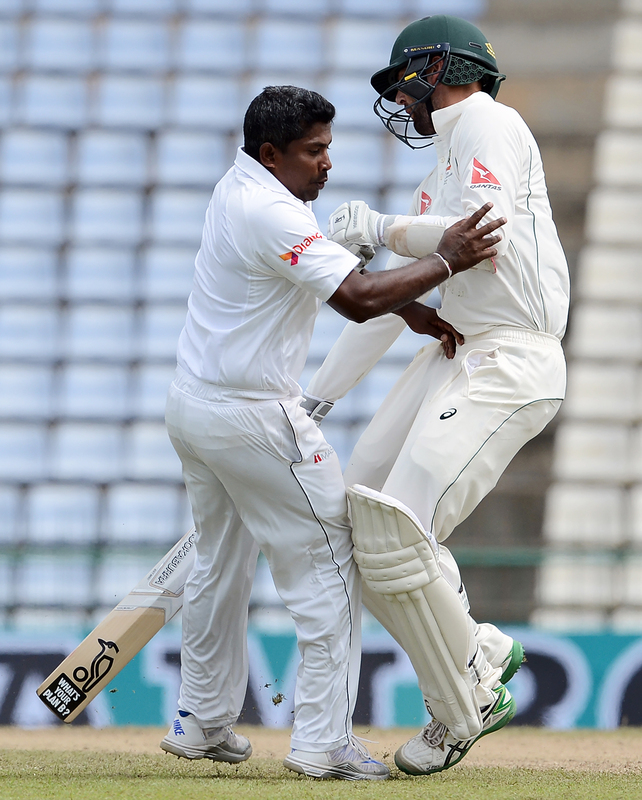 Starting the home Tests with a pair of barren displays against South Africa, Lyon was fast running out of mates. One spring afternoon at Drummoyne Oval last year, Berry ventured down from a television commentary stint for a Matador Cup game to chat to Lyon by the boundary. It was not a happy conversation. "I've never seen him so clouded and confused, and I felt then that he was getting so many messages from different people. I said, 'Mate, my advice to you is: go to the people you trust, whether that's your parents or Davo. If it's me, you know I'll be there for you whenever. Clear your mind. You haven't lost your talent. What you've lost is your confidence in your talent.'" Being told to bowl more like Herath or other Asian spinners was one thing; actually finding practical ways to do so in the midst of an Australian season while trying to hang on to his place was quite another. With Berry and Davison, the first thing Lyon had to do was determine what would work for him, his body and his action. As a start, Lyon already had the phrase that would help: "bowl ugly". That had come from a few sessions he had with Davison and Shane Watson when vying for inclusion in Australia's 2016 World T20 squad. "Just dumping the ball across a right-handed batter for a square cut for one is actually a good ball in T20, but it goes against your psyche," Davison says. "In your head it is ugly because it's something you've trained yourself out of doing from a young age - bowling undercutter type things, to dipping, bouncing offbreaks, which you think you can get anyone out with. But on flat wickets, with big bats on small grounds, it's a big-risk ball in short-format cricket." What "bowl ugly" evolved into was a way for Lyon to see himself doing the right job for the conditions without sacrificing who he fundamentally was - a tall, "over the top" spinner looking for bounce. "Our batters always talk about putting away their egos. I think as a bowling group you need to do the same thing," Lyon says. "You need to look at the way the Indians or the Sri Lankans or the Bangladeshis bowl and learn the way they're thinking and the ways they're trying to get us Australians out. "There's a degree of change, but there's also the fact you can't go away from your stock ball. I can sit here and say I believe my stock ball will get anyone out in the world in any conditions, but it's about challenging their defence more regularly from different angles, spots and variations. That's the biggest key in the subcontinent." Of course as Lyon, Berry and Davison were working through these issues, Australia were losing their fourth and fifth Test matches in a row. Several inept batting displays had exposed Lyon and other bowlers, and though he was not discarded, the selection of Steve O'Keefe for Adelaide against South Africa gave a pretty strong idea of how close Lyon was to the precipice. Lyon kept his place more through luck and durability than his actual bowling. O'Keefe, seemingly set to play instead, strained a hamstring in the Sheffield Shield round played between Tests, granting Lyon a reprieve. Aided by an improved batting display, he contributed to wins in Adelaide and Brisbane, before taking a more central role at the MCG. Much as the Australian team was rehabilitated over the course of the summer, Lyon also regained his groove. He still had to find a way in India, however, and during the Big Bash League he spent considerable time with both Berry and Davison. "When the Sixers came down to Melbourne for the BBL, we had a bowl for about an hour. I just tweaked him back to confidence more than anything, not so much technical." For the mechanics, Davison and Berry looked at both Herath and R Ashwin, but were careful as to what for. Rather than asking Lyon to drop his arm path or try to undercut the ball, they advised him to look closely at the groupings for Herath's deliveries, which emphasise nagging accuracy, a consistent threat to the stumps, and subtle changes in pace and arc. 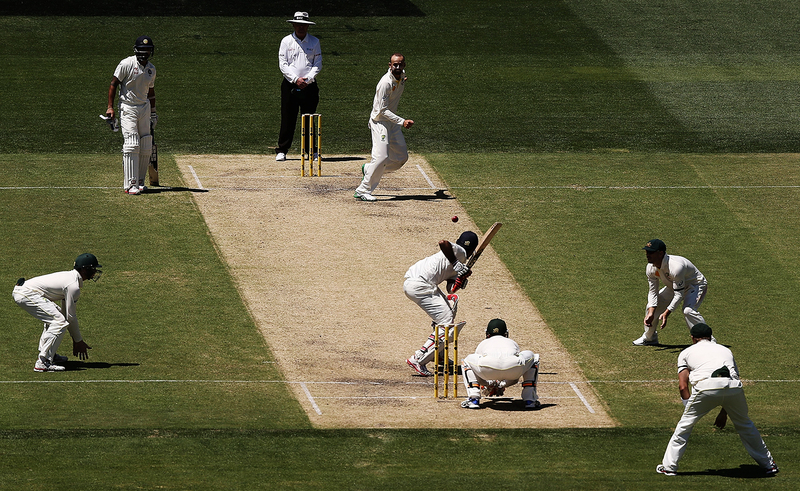 Ashwin's bowling, meanwhile, offered an example of the sort of trajectories Lyon needed, coming from a greater height but bowling at a pace and rhythm that dissuaded batsmen from sweeping or jumping down the wicket. "He needed to be a little bit flatter and a little bit more at the stumps for the blokes who use their feet a lot better," Berry says. "He was leaking runs through the leg side and I said to him, 'On the subcontinent players use their wrists and they'll hit you from off stump through the leg side all day, so you've got to get an extra fielder at square leg because they'll just milk you for three singles. Adjust your feet on the crease and bowl a little straighter at the bat so they can't get at you, but still stay outside off stump because you're an offspinner. "Consistency is Nathan's strength. It was just what he knew in Australia, and he would always bowl up and over the top, pitch outside off stump, spin in. But in the subcontinent he got too high with the loop. They'd get to him with their feet, and he couldn't understand what was going on. We didn't change too much with seam position or line, but with trajectory - just mix one up and four down as opposed to probably 12 up and one down [which is] his repertoire in Australia where he gets bounce." Lyon also had a session alongside Daniel Vettori in Brisbane. "We organised a session about how he went about bowling in India and got a similar message about being deadly accurate and hitting the stumps more often than not," says Davison. "The wheels were moving over the summer and after the Sri Lankan trip." By the time of the India tour, they had well and truly turned. The sun beat down on Bengaluru as Lyon pondered how to find a way past Cheteshwar Pujara on day one on a pitch that looked dry but amenable to run-making. Called into the attack for the 22nd over of the innings, Lyon started with a mistake - a flat delivery that was too straight, allowing Pujara to work a single through leg. Next over, Lyon offered a smidgeon more air to Pujara, who danced down to consecutive deliveries but could not get to the pitch of either, bunting both defensively to midwicket. After staying back to the next, flatter, ball, Pujara was surprised by a slower delivery that bit off the surface and flew behind short leg. The single rotated the strike, but not without an anticipatory smile from Lyon - he was gaining control. Third over. Again Lyon offered flight but also got drop, and Pujara was still unable to get to the pitch. He defended another flat offbreak down the wicket, before Shaun Marsh dived at midwicket to stop a flick from penetrating a carefully set field. Pujara did get off strike fourth ball but was again discomfited by bounce before making his one successful sally down the pitch to work a single from the sixth. The clock was ticking towards lunch. Natural instinct would push Pujara further onto the defensive. The two resumed battle minutes later in the morning's final over. First, Pujara covered up to defend a flattish delivery on the stumps, killing the bounce and turn with soft, late hands. Second, he tried to get down the wicket a fourth time but failed again, leaving the ball to bounce and rebound from both pads. Balls three and four were flighted as temptation, but Pujara offered only defence, barely covering the fourth as it turned in to take the inside part of his bat. The fifth was quicker, flatter and loaded with spin. Pujara shaped to come forward but had to re-adjust upon realising that the trajectory had changed. In trying to correct himself, he could not cover for the bite and the bounce, meaning an inside edge went to pad and then to Peter Handscomb at short leg. Lyon and his team-mates celebrated not just a single ball but a sequence of mastery. Pujara had faced 15 balls from Lyon, scored four singles, tried four times to go down the wicket and managed to get to the pitch just once before being dismissed. Lyon, meanwhile, had bowled only one delivery that could be termed "loose". It was sustained excellence, and a microcosm of his Asian efforts in 2017. Much as Berry in his generation had been reminded of Tim May, Chappell was struck by how much Lyon's tall, slender frame, high action and drift, drop and spin recalled Ashley Mallett. In years when Australia were known primarily for Dennis Lillee, Jeff Thomson and Max Walker, Mallett offered a thoughtful and teasing spin counterpoint. An ensemble performer and also a fine gully fielder, he could, on occasion, be dominant when conditions suited. Ask Chappell to rate Lyon's achievements in India and Bangladesh this year and he has to think back to Mallett's 1969-70 tour of India for an equivalent by an Australian offspinner. Mallett's 28 wickets at 19.10 over five Tests had long stood as the standard. This year, in six Tests, Lyon scooped 41 at 19.39, dominating in a way that showed how enormously he had grown in skill and range since Sri Lanka. "It seemed to be a period in which he started to experiment a bit more, doing things a little bit differently in the subcontinent," Chappell says. "I think he outbowled the Indian spinners in India, which is quite an effort. I've been watching Test cricket and remembering it for probably 60 years, and there haven't been too many fingerspinners to do better than he's done." Smith, who challenged Lyon to adapt, grew appreciably in his admiration this year. "Something Nathan adapted really well from Sri Lanka to India is when guys were trying to sweep him. He'd throw in a quicker ball and make them think twice about playing that shot and get them back to defending. "When they're defending, I think he looks very dangerous, as well as bowling some cross-seam deliveries that don't drift and go a bit straighter - something he wasn't doing very well in Sri Lanka, but I thought he did extremely well in India and since then in Bangladesh as well." Davison, who will link up with Lyon again during this summer's Ashes, believes the trials of last summer and subsequent vindication have Lyon feeling more secure than ever. "He was always looking over his shoulder, because the press and everyone saw him as a stopgap, waiting for the next big match-winning spinner to come along. I don't think he felt hugely embraced for a long period of time. He probably put a fair bit of that pressure on himself really, but to have some successes and come through the other side has been great for him." Berry sees a direct correlation between the quality of Lyon's character and the way his bowling has grown - a level of progression that has not been true of all spin bowlers. "He's been underestimated for his skill because it's the unsexy offspin. He's not Warne, he's Lyon. Many doubted him and said, 'I'm not sure about him.' I think many still say 'I'm not sure.' But it really is an amazing story from 'Hey, I want to bowl', from Young to Canberra to Adelaide, rolling the wickets, have a bowl, 'This kid's good', stick him in the Big Bash, nine months later Test cricket and now 269 Test wickets." As for Lyon himself, the memories of Young and club competition, of mum and dad and Brendan and coach Dave Keenan and that game in Cowra and all the car trips to Canberra and the decision to gamble on cricket and turf curation - it's all part of how he got here. "There can be a lot of positives from growing up in the country," he says. "You play against grown men at a lot younger age, you're playing on turf wickets, you're understanding them a lot quicker. Some kids out in the country don't have all the bells and whistles that a lot of the kids in the city might. Growing up in the country can be beneficial for a lot of different reasons, but especially looking at a cricket career, you're putting yourself in uncomfortable situations a lot earlier than city kids." For those situations Lyon can thank Dean Schofield, among others. They made him earn it.